Every eCommerce Director is always looking for new ways to grow revenue and one of the many different ways to do this is to try to increase average order value (AOV). Now, this doesn’t mean you need to increase prices and alienate your loyal customers. In fact, there are ways to increase AOV that can benefit your customers as well as your bottom line. If you’re running low on ideas, I’ve compiled six actionable tactics for increasing average order value, as well as a bonus idea to get your brain thinking of some other innovative ways to improve AOV and ultimately increase online sales. This one is a classic, but remains effective. Nice Laundry does a great job of this with their $99 “Sock Drawer Makeover.” You can buy individual sock packages for $49 each or buy three for $99, giving the you the most bang for your buck with $48 in savings. Yet, Nice Laundry doesn’t lose out. Your order value rises from $49 to $99, essentially doubling the worth of that one customer’s purchase. I like the fact that you can add items to the cart right away and see your shopping cart without having to click through to another page. The red bar shows the number of items you need to add to qualify for the “Sock Drawer Makeover” discount. This is another tried-and-true tactic for raising your AOV (don’t worry, we’ll get to some innovative tactics soon). 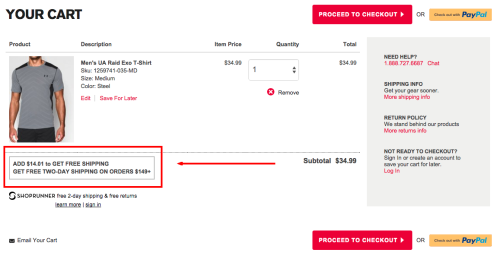 Under Armour deploys a reminder letting you know exactly how much you need to add to your cart to qualify for free shipping. This encourages users to add items to the cart while letting them know exactly how far they must reach for that discount. At the end of the day, you’re increasing your AOV to $49. Under Armour’s two-tiered free shipping adds an interesting twist, giving users the option for free two-day shipping on orders over $149. This is a great way to raise the AOV for customers who are already spending over $100. If you can’t offer bundled items for all future purchases, you can explore offering bundle discounts for first-time visitors. Bombas does a great job of hitting first-time users with a 20% discount on purchases of four pairs or more. Instead of having first-time buyers purchase a $9 pair of socks, their order value rises to $28.80 on four pairs. One of my favorite tactics out there is from Stantt. Stantt offers tailored shirts based off of three simple measurements you can take at home. If you need a tape measure to take your measurements, they offer two options. The first is a tape measure for $1.00, which seems like a great deal until you see the tape measure kit offered right next to it. The tape measure kit comes equipped with not only a tape measure, but with color samples and a $5 gift card. Essentially, the customer gets their money back when they buy the measuring kit, and later when they buy the shirt with the gift card. At the end of the day, it’s like getting a free tape measure. This encourages a higher-priced item and a follow-up purchase. The customer wins with a “free” measuring kit, and Stantt wins with a higher-priced item and the prospect of a shirt sale. Everyone is looking for a sale or a deal to save money. 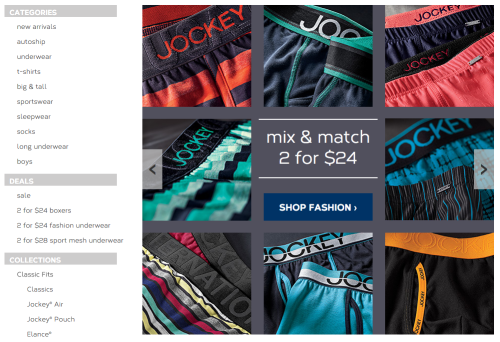 Jockey offers a “Deals” section where you can buy two boxers for $24. Having a constant “Deals” section encourages bargain-hunting shoppers to find one, while you still get to increase AOV. At the end of the day, again, the customer saves money on the number of items they’re purchasing and Jockey increases that order value by having the customer purchase two items as opposed to one. This is a great tactic for two reasons. One, you can use this to increase AOV by offering coupons for bundles. For example, Indochino’s Father’s Day coupon works on purchases of any suit, shirt and tie together. The customer receives a 20% discount, and Indochino receives a larger order. 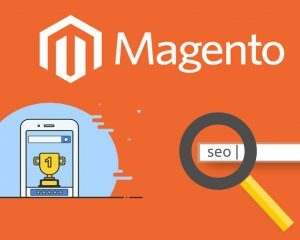 The second reason this method is great is because it helps attract users who search for “Indochino Coupons.” Rather than lose traffic to coupon sites such as retailmenot.com and coupons.com, you gain traffic for anyone looking for a deal and increase order value at the same time. 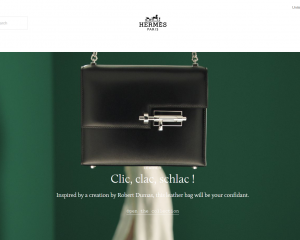 How well are you utilizing your cart abandonment emails? If you have a minimum threshold for free shipping, why not encourage shoppers to add items to qualify for free shipping? Sweeten the deal for both you and your customer. For example, if you offer free shipping on all orders over $99, then you can target abandoned carts with totals from $75 to $99 and offer supplemental products that are priced $25 or more. If they match the free shipping threshold, then let them know that they qualify for free shipping. This might give them the extra incentive to purchase items they left in the cart and to add some more. These are just a few ways you can increase AOV. If you are looking to build your ecommerce website, contact us at Sweetmag today!